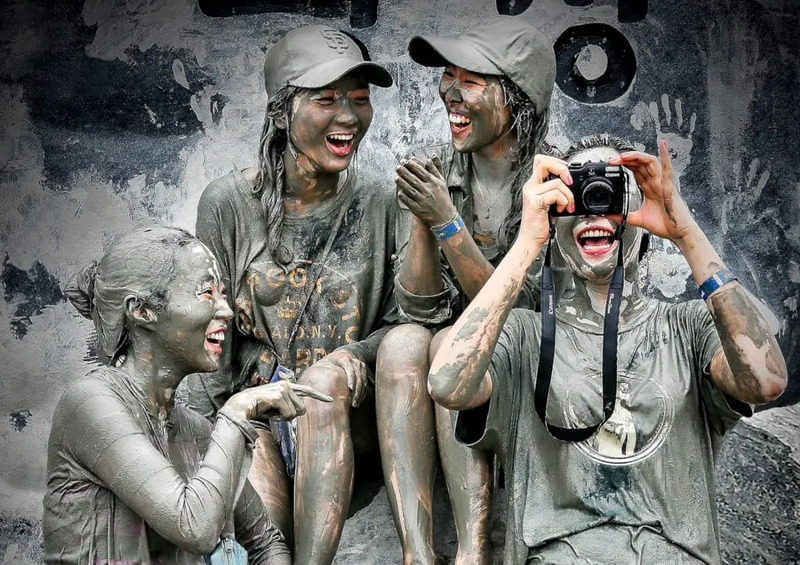 At the Boryeong Mud Festival in South Korea, everything revolves around one and one thing only: mud. 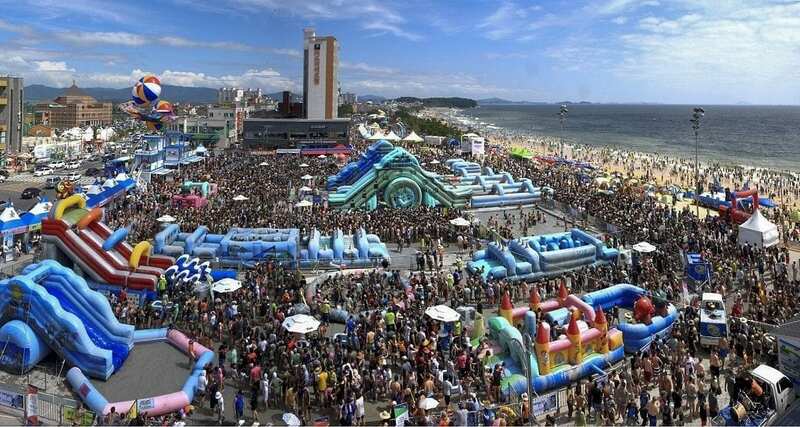 During 10 days the beach of Boryeong transforms itself into a mud heaven with bouncy castles, slides, football fields and even inflatable prisons all filled with nothing but mud, turning this event into one of South Korea’s most popular happenings. Combined with live music and DJ concerts, this is the place to get down and dirty Gangnam style. What is the Boryeong Mud Festival? Boryeong, a city on the Yellow Sea coast in South Chungcheong Province and some 200 km south from the capital Seoul, immerses itself every year into what is believed to be the healing properties of its natural sea mud. The organisers transfer mineral-rich mud from the Boryeong mud flats to Daecheon Beach and use it to build mud baths, mud slopes and mud pools. The Boryeong Mud Festival is child friendly. The normally tranquil seaside resort then turns into a chaotic playground of mud where the staff make sure you don’t stay clean. Luckily the sea is always nearby to cool off while K-pop and EDM beats make for a real festival vibe. The Boryeong Mud Festival is also popular for its special opening and closing ceremonies which typically include large music performances and fireworks. The mud on the 136-km-long coastline of Boryeong is rich in minerals that have rejuvenating effects on the skin, so when in 1996 a range of cosmetics was introduced using the grimy substance from the Boryeong mud flats, a couple of years later the Boryeong Mud Festival was conceived to promote the products. Taking a refreshing dip at the beach. Photo by Kai Hendry. The festival itself quickly grew more prominent and now attracts yearly millions of domestic and international visitors while last year it received its 10th consecutive Pinnacle Award – a professional recognition in the international festival and events world – making it an established global event. During the festival, several huge attractions in the seafront area will ensure both young and old receive their fair amount of mud. A giant mud pool, a mud prison (in which you get mud slung at you in good old Medieval fashion), mud slides, mud wrestling, mud marathons, street parades, yachting and even mud skiing competitions will all help you lose those excess calories while keeping your skin young. 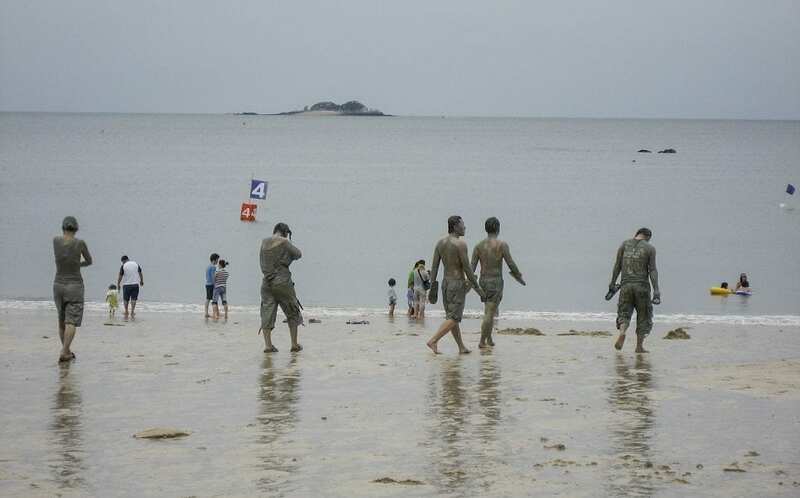 The Boryeong Mud Festival now attracts hordes of visitors. For those inclined to a more relaxing experience, the mud massage zone should do the trick while a small seaside market sells cosmetics made from local mineral-rich mud. In addition there are health and beauty clinics offering different kinds of therapies including acupuncture and massage. The festival is also suitable for kids with small, adapted mud pools. But it’s not exclusively about mud – the evenings will see live music concerts (Gangnam Style’s Psy performed in the past), rave parties and a World Skin Beauty Pageant. If all this makes you feel hungry then local restaurants will dish out both regional and international fare, to be washed down with Korean beer and soju, South Korea’s favourite liquor. The last weekend of the festival’s ten-day period is the most popular where literally nobody can escape spot-free. Typically, a large firework display will close the event. Bring a clean shirt. Hordes of tourists will descend on Boryeong during the festival and if you want to secure accommodation, you’ll have to book well in advance. 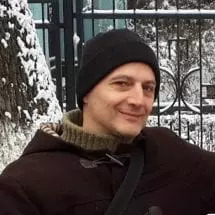 Be aware that prices double during this period. Use our Hotel Booking Portal to find the best deals via Agoda or Booking.com. Many Koreans also offer minbaks as an extra source of income. These are rooms you can rent at homes of families and during the Boryeong Mud Festival there are more minbaks available than other kinds of accommodation – a great way to get to know the locals. Check out the Boryeong Mud Festival official website. Some events are free while others charge entrance fees.